Curd rice is a very popular south Indian dish and is truly a comfort food. It tastes great with just a pickle or . Curd rice is also known in Indian languages as Dahi Chawal (Hindi), Thair sadam (Tamil), Mosaranna (Kannada), Dahi Bhaath (Marathi) and Dhadojanam (Telugu). The word “curd” as used in India is usually referred to liquidy, sour, unsweetened yoghurt. It is most popular in the Indian states of Andhra Pradesh,Karnataka, Kerala and Tamil Nadu. 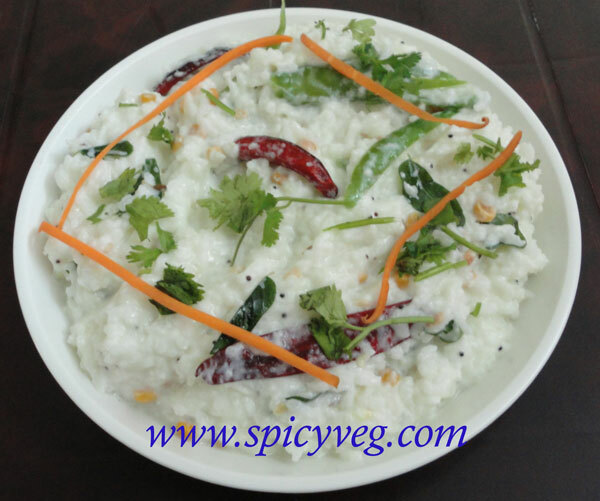 Curd rice or Yogurt rice is a simple delicacy made in South India. Cooked rice is combined with curd or yoghurt and then seasoned with chilly, curry leaves, ginger, urad dal, mustard seeds, channa dal and hing. Alternatively, it can also be prepared by mashing cooked plain rice (mostly leftovers), and then mixing it with some salt, yoghurt and (a bit of milk to lessen the sour flavor of yogurt or to stop it from souring too much) tempering it with fried urad dal, mustard seeds, green chilli and chopped coriander. 1.Pressure Cook One Cup of Rice with 3 cups of water. Rice has to be Over cooked, so that it could be easily mashed. 2.Pressure cook the rice upto 5 whistle count. 3. Add curd and salt.Mix well. 4. Chop green chillies and ginger finely. 5. Heat oil. Fry mustard seeds urad dal cumin and asafoetida. 6. Add curry leaves and chopped ginger and green chillies. Saute for 2 minutes. 7. Switch off the fire and add the rice curds mixture to the pan. 8. Mix well. serve with with pickle.